Congestive heart failure (CHF) or simply heart failure, is a condition where the heart fails to pump adequate blood to meet the body's need. Unlike a heart attack, the heart does not stop beating - rather, it weakens over the course of months or years so that it cannot pump enough blood. As a result, pulmonary congestion or fluid build up occurs in the lungs. Enlarged heart and accumulation of fluids in the lungs in congestive heart failure. Muscles of the pumping chamber of the heart can become so stretched and weakened that the heart cannot pump enough blood to reach all of the body's tissues. The heart muscle can become stiffened or thickened. This prevents enough blood from filling the pumping chamber, and as a result, not enough blood is pumped out. Stenosis or narrowing of the heart valves (such as aortic valve stenosis, mitral valve stenosis, pulmonary valve stenosis) and prolapse or floppy valves (such as mitral valve prolapse) can increase the workload of the heart. To compensate for inefficient pumping, the heart can undergo irreversible structural changes called heart remodeling. In some cases, the left ventricle can enlarge and change shape. There are changes at the cellular level as well, such as early cell death that causes the heart muscle cell to die. This type of heart failure is the most common type. It occurs during the systolic or contraction phase, and affects the left side of the heart. Here, the left ventricle is usually enlarged and fluid accumulates in the lungs. This type of failure occurs during the diastolic or relaxtion phase, and usually affects the right side of the heart. It is usually caused by thickened heart muscle which prevents the heart to relax completely. As a result, blood cannot efficiently enter the heart and backs up in the veins and surrounding heart tissue. Clammy, pale, and bluish-tinged skin. These symptoms (especially the symptoms of pulmonary edema) are serious and require immediate medical help. Irregular heart sound, such as ventricular gallop or a distinct hearbeat can be heard using a stethoscope. Rales or crackling breath can also be heard. Enlarged and tender liver, swollen feet and legs, fluid retention and elevated pressure on the neck veins and arteries can also be diagnosed. 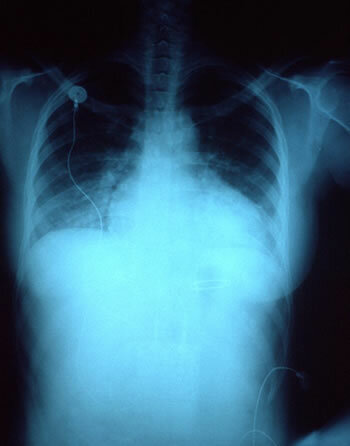 Enlarged heart can be seen using a chest x-ray and electrocardiogram (ECG). Abnormal heart rhytm can also be visualized with an ECG. Also called Doppler flow test, echocardiography is the best diagnostic test for congestive heart failure. Here, ultrasound is used to visualize the beating heart, valve function, and blood flow. By calculating the ejection fraction or amount of blood pumped out during a heartbeat, your doctor can determine the severity of the condition. In this test, a catheter is inserted into the heart to measure internal blood pressure. Thanks to modern medicine and prompt treatment, heart attack or myocardial infarction is now very survivable. The attack itself, however, can lead to dramatic increase in developing congestive heart failure. In this condition, the arteries of the heart is blocked by atherosclerotic plaque deposit. In addition to directly causing a heart attack or myocardial infarction, hypertension or high blood pressure can also cause heart failure without an attack. High blood pressure causes the heart muscle to thicken, and over time the increased force to pump blood can cause it to weaken. High blood pressure is implicated in over 75% of all cases of heart failure. Abnormal narrowing or improper closing of the valve leaflets can interefere with blood flow and cause the heart to work harder. Left untreated, diseases such as rheumatic fever can cause scarring of the heart valves. Most heart valve abnormalities, however, occurs during fetal development and is congenital or present at birth. These diseases damage the heart muscles and causes them to become too thin or too thick. In Idiopathic Dilated Cardiomyopathy, the heart ventricle become enlarged and the muscles become too thin. Although the cause is unknown, it is thought that viral infection triggers the body's own immune system to erroneously attack and kill heart muscle cells. In Hypertrophic Cardiomyopathy, it is thought that loss of power in the heart muscle cells cause the heart to compensate by building more (and thus thickening) the heart muscle. This rare condition often made news as the cause of death of young athletes. Chronic alcohol abuse can also reduce the heart muscle's effectiveness and cause damage leading to cardiomyopathy. Remodeling is structural and cellular change of the heart in response to impaired heart functions. For example, to compensate for increased input due to high blood pressure, the heart can grow in size or enlarge. This is often done by elongation of the heart muscle cells, which result in thinner and weaker cell walls. The cell muscle itself becomes thinner and weaker. To compensate for weakened pumping action, the nervous sytem can signal the heart to beat faster. In the long run, this actually create more damage. The body's blood vessel can also change: to compensate for lower blood flow, they constrict and become more narrow. In turn, this cause the heart to work harder and beat faster thus increasing blood pressure and compounding the vicious cycle that will ultimately lead to heart failure. Hyperthyroid disease or other tachycardias (rapid heart rate) can stress the heart by increasing its workload. About 5 million people in the United States suffer from this condition, and every year about 500,000 new cases are reported. About 250,000 people die every year because of heart failure. Since this disease is a progressive condition (ie. it worsen with time), the risk of heart failure is increased with age. It is now the most common reason for hospitalization in the elderlies. Tendency to develop heart failure, especially when caused by cardiomyopathies, may run in families. It is important to note that dietary habit of the family must be taken into account: when all members of the family eat high fat, high cholesterol diet, this maybe the underlying cause of atherosclerosis, not genetics. Men are at higher risk of developing heart failure than women, although the difference narrows with advancing age. African Americans are at higher risk than Caucasians, and have higher mortality rate due to heart failure. Afrian Americans tend to develop diastolic heart failure (inability of the heart to relax properly), whereas Caucasians tend to develop systolic failure (inability to pump blood) first. Chronic alcohol use can lead to high blood pressure, heart muscle damage, and even cause cardiomyopathy. The carbon monoxide in cigarettes is thought to damage the heart muscle and increase its susceptibility to virus infection. Sedentary lifestyle, lack of exercise and eating fatty foods can increase the risk of developing coronary artery disease, which lead to heart failure. In addition to coronary artery disease, previous heart attack, high blood pressure, and valve abnormalities, other diseases such as diabetes, emphysema, HIV-infection and other infection-caused cardiomyopathies, hyperthyroidism, amyloidosis, and myocarditis can lead to increased risk of heart failure. In rare instances, women can also suffer heart failure during childbirth in a condition called peripartum cardiomyopathy. Older chemotherapy used to treat childhood cancers, use of anabolic steroids, and certain anti-fungal drugs can lead to heart failure. Lack of thiamin (vitamin B1) can lead to cardiomyopathy. Luckily, this condition is reversible by adding enough vitamin B to the diet. Treating heart failure almost always mean treating the underlying cause of this condition. These include lifestyle changes (stop smoking and stop drinking alcohol) and dietary changes (eat healthier food, stop eating fatty diets) to treat coronary artery disease, treating high blood pressure and heart valve abnormalities, and so forth. Also called water pills, diuretics reduce the volume of blood and decreases congestion or fluid build ups by inducing the kidney to release salt. This reduces the blood pressure and lightens the workload of the heart. These medications lower the blood pressure by enlarging or dilating the arteries and also by reducing the volume of blood. ACE Inhibitors significantly reduce the death rate associated with heart failure, and therefore becomes the front-line medications for this disease. For some reason, ACE Inhibitors are less effective in African Americans. In addition to this medicine, other vasodilators (medicines that dilate the blood vessels) such as hydralazine and nitrates are often used. These drugs strengthen the heart's contraction so it can pump better. These include digitalis (digoxin), dopamine, and others. In combination with other medications, beta blockers can be prescribed to slow the heart rhythm. Beta blockers should be used with caution since they can also decrease the pumping efficiency of the heart. Severe heart failure may require surgery, such as baloon dilaton of artery blockages, heart transplantation, pacemaker implants to control the heart rhythm, and insertion of portable pumps to infuse medications. In cases of valve defects, surgery to repair or replace the damaged valves may be necessary. The prognosis of heart failure is fair to poor, although advances in medicine continues to greatly increase expected lifespan. The annual mortality in people with mild, stable symptoms of heart disease is about 10%. In those with severe and progressive disease, the mortality rate can be as high as 50%.